Cardiff City manager Russell Slade says Craig Noone has made a "very strong claim" to start his first Championship game of the season after a second spectacular goal in as many games. Noone's fine free-kick saw Cardiff beat AFC Wimbledon 1-0 to reach the second round of the League Cup. That followed his long-range equaliser after coming on as a substitute against Fulham in the Championship on Saturday. "Nooney has put a very strong case forward," said Slade. The Cardiff boss says Noone's goal in their league opener at the weekend was "fantastic" and his free kick against Dons enhanced his starting chances. "That's what he's striving for and trying to do. And he's delivering right now," said Slade. "As a manager you want players to ask questions if they're not starting and put themselves in the frame for the very next game." Meanwhile, Slade insists there have been no talks with striker Kenwyne Jones over a new contract. 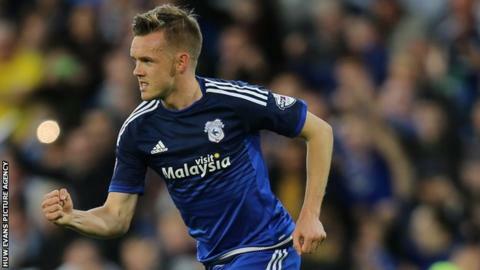 Jones is one of Cardiff's highest earners and spent the end of last season on loan at Bournemouth. It has been reported Cardiff are ready to offer the Trinidad and Tobago international a new deal. Although Slade says that is not yet the case, he has not ruled out a new contract for Jones. The former Leyton Orient manager added: "He's now in the last year of his contract and, if he does well, I'd like to think it could be longer term."